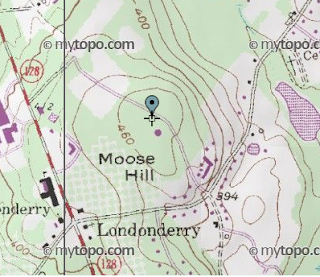 HockeyPucks hiking and highpointing: Moose Hill - 471 Ft.
From route 102 in Londonderry look for the sign pointing to the Londonderry Recreation Fields and turn on to Sargent Road. After 0.15 miles the road makes a sharp right. Continue 0.15 miles to the large parking lot. From parking at the Londonderry recreation fields head towards the southeastern corner of the parking lot and look for the gated access road. Pass through the gate and follow the gravel road past a few baseball fields 0.15 miles to the Moose Hill summit. There is a government building located at the summit. The building itself is marked with No Trespassing signs however they can not be seen until you reach the building itself. The access road appears to be public property. There summit area is open however the views are very limited. Moose Hill was originally part of Moose Hill orchards which is owned by Mack's Apples of Londonderry and established in the 1700's. According to a book called “History of Rockingham and Strafford counties, New Hampshire”, references the wild animals of Londonderry when the area was settled. The book states, “A moose killed in the West Parish gave name to a hill there of five hundred feet elevation.” I also read that there is a "beehive like stone cistern" which remains on the hill. Water was pumped from a well near the farmstand to the cistern via a windmill. The cistern used to feed water to the old homestead. Unfortunately, I wasn't able to find any evidence of these remains during my visit.